What’s the meaning of my life? Life can take us on many twists and turns, both good and bad, but do we always know why? What’s our barometer for navigating life? Do we know why we’re here and where we’re going? What does ‘life purpose’ actually mean? The term ‘life purpose’ can be misleading. Some people infer that having a life purpose must mean something grand, impacting the world like Ghandi or Mother Teresa. The truth is that you can never be ‘off purpose’. You are already living your life’s purpose, just by being you and being alive. You came here to live in your body on this planet, which is your purpose. You can’t avoid being you. So the word ‘purpose’ is relative. Life purpose simply means living. Don’t beat yourself up for not having a life purpose, because you already do and you are living it. Feeling like we have a purpose is different because it’s an essential part of being happy. We all need to have a sense of meaning and direction, otherwise we dart in different directions or go around in circles, which is exhausting! So having a life purpose is about having direction: knowing where you are going and why. Where does our direction or purpose come from? Our purpose is to express our soul qualities in our physical bodies. Our souls have particular qualities that manifest in our lives as gifts and challenges: what we are naturally good at and what we need to learn. This is why we are already ‘on purpose’; we naturally have these gifts and challenges whether we like it or not! What are gifts and challenges? Your gifts and challenges are like a see-saw that needs to be balanced and find its centre. 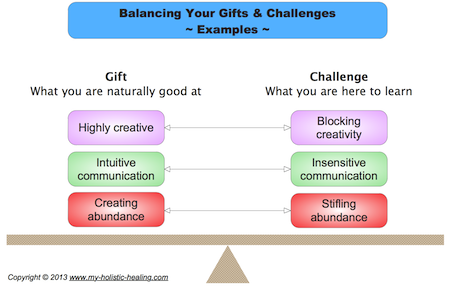 Finding this balance means that you understand your gift, in other words, what it feels like to use it well and what it feels like to misuse it. Once you find this balance you allow your gifts to flow freely, and you create a positive impact on the world around you. How do I find my life purpose? Since we are here to share our gifts and learn from our challenges, becoming closer and more familiar with your soul’s gifts and challenges starts to give you a very clear sense of purpose and direction. Strengthen your Soul Connection – The more connected you are to your intuition, the more awareness you will have of your soul’s qualities. Understand Yourself – The better understanding your have of your personality’s strengths and weaknesses, the more clarity you will have about your purpose. Serve Humanity – Finding ways to be of service to your fellow humans and the planet brings you much closer to your purpose. Master Your Gift – To master your gift, you need to learn to be aware of and overcome the challenges that come with it. Get Outside Your Comfort Zone – The more you push yourself to learn new things and take on new challenges and life experiences, the closer you come to your soul purpose. Find Your Place in Nature – We are all a product of mother earth, so if you want to get in touch with what you’re here for, go and spend some time in your favourite place in nature. The more time you spend connecting with the earth, the more you connect to yourself and your purpose. Desire – How much do you actually want to live your purpose? The more you want it, the more you will do to get it, and the rewards will be far greater than you imagined. 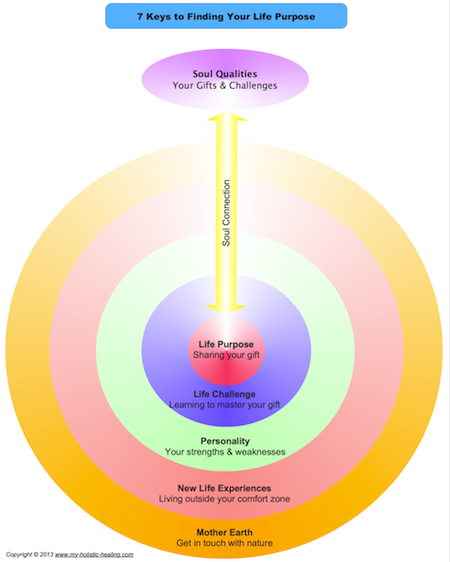 To find out more about your gifts and challenges, go to Master Your Soul Gifts. Return from 7 Keys to Finding your Life Purpose to homepage.